Here are the defaults I’m proposing for a start. Dash-to-dock on the left side. It’s not what most users are used to. Coming from major operating systems it’s always a thing hard to learn. Dark shell, light application. It is unnecessary contrast and big inconsistency in the look and feel of desktop. Also worth noting is that shell do not have shadows and applications has it. Colours are not complementary, fonts look different, whole look is just a bit off. I’m not afraid to use it - it’s ugly. Application launcher. This is most ridiculous invention from the Gnome team ever. It’s not user friendly, it’s slow, it looks like mobile screen, and you need to choose it from icon list. Can’t put it for the muscle memory to take care of it. Overall UX from the desktop suffer from this poor choice. It’s fancy though, eh? Activities. Personally I’ve never used it. If someone is, Super is the shortcut, placing it in the left-top corner is a swing and a miss. Dark/Light mode. It’s a must. Even Windows made dark mode. Which looks horrible btw, it’s goddamn black. What would you expect from them? I’m not sure how to make it. But we need something to change shell and applications theme at once without fiddling in gnome-tweaks. Shell Icon? Option somewhere in settings? The ones I’m using right now are Matcha-dark-azul and Matcha-azul. I’ll try to reach the author and maybe he will be willing to participate. Dash-to-dock. I know, it looks like Apple. But it’s good. Just good. With dynamic opacity change and inteligent auto-hide. Application launcher. I don’t believe we could find developer to make one and original for us so for now we can use panther-launcher. Fork from elementaryOS slingshot. By default it is taking a lot of space but it’s possible to make changes in dconf to set number of rows/columns. The best thing it’s fast, it’s usable as hell and you can just type to find something quickly. This is what app launcher should look like. No top left hotcorner extension is need for this one. Now you can train your muscle memory to use it. If you want to reproduce my setup and give it a try here is what you will need to do. 2. Set it in Gnome tweaks for both shell and applications. 3. App menu is panther-launcher-git. 4. In dconf editor search for panther and change rows to 3 and columns to 4. There are some glitches with it so after setting rows/columns go to icon size switch on/off default and apply. This will change grid for launcher. 5. No top left hotcorner extension is needed to comfortably use app launcher. 5. Dash-to-dock, set it to bottom, uncheck Show application icon, set customize opacity to Dynamic and minimal opacity to 0%. @joekamprad and @aiphoenix I’ll need a bit more time to finish this. Stupid job related things are holding me back. Who need work anyway? Look at panther-launcher in the mean time. It’s a fork from pantheon slingshot. Playing nice with my overall simplistic vision. Click-scroll-select or click to search. Gotta love this workflow. I’ll have to agree. Brand is the least of the problems that AntergOS has. Yeah, I know, probably, maybe, as I don’t have any problems with it. Well… No. Many non-profit organisations care about their brand as this can have impact on many more things then just “sell”. I can see that you are strongly against rebranding but can’t get a real grasp why? Your arguments tend to be a bit off for this case. 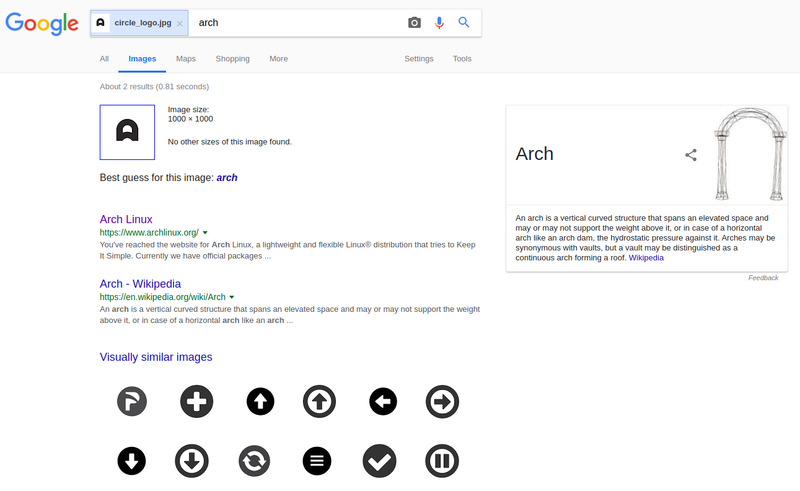 For example, you are saying that many Arch based distros are using A in a logo, and you know what? Apple is using… Wait for it. Apple. @trytip I don’t understand? Why? I’ve posted first pages of visual guide to avoid making such things. I’ve tried to find similar logo but without a luck. @ringo32 being different doesn’t mean being better. And being different for the sake of it doesn’t have any sense. Antergos is starting with A, Arch is starting with A, Antergos is based on Arch… So I don’t see any point here. We can use B. It’s different. We can use abstract sign, it’s also different but does it mean it is better? Lastly there is also point about idea, story, and realisation. I’ve some account on github, but I’m more of bitbucket user. You are followed by @realcgslav - long story . Main function of any (!) design is solving problems. If it’s appealing also, it’s even better. If somethings is good looking but useless - it’s called art. My job here is to solve a problem which is lack of consistency in visual and linguistic code of operating system called antergos and to work a way to communicate it to the public (users). I just want you to understand motivation and realization of my idea. It’s completely fine if you don’t like letter “A”. I have no problem with that. But there is more to it than just a logo. @joekamprad Everything what is needed to be done is in my first post here with marking what I can do by myself. I only need help with themes and this is exact question I’ve asked before ;) Also I wanted to show what I have made so far. How are you? I’ve already spoken with the other members and they agree to collaborate with you. Q: How many more developers is needed to have everything covered? Q: How much could you customize antergos? Q: How much want you customize antergos? Q: What is most important thing in antergos development? What’s not modern in my proposition? :) Or maybe, what constitutes modern logo? Do Nike has modern logo? Apple, Google, Facebook? They are as modern as context where they are put into. Most important thing about them is the flexibility and timeless recognition. I should also add that using modern term by me and some other designers after some kind of design education (I’m after university) is probably badly used (or translated) as we are referring to the modernism as an art/design/philosophical movement started in between 19/20th century. Sorry for that. Thanks god for that. We certainly do not want logo mark to be so obvious and overly detailed. It’s all about semantics. We are creating it. Trough story, narration, backgrounds, mood, communication etc. My proposition is a shape based on “8” number formed into letter “A” with story based on historical figure. Taking our perception and cognition (from neuropsychologie studies) it’s a way to go mix. Especially for our brains. I didn’t use any “trends” that are taking place here and there by logomakers (not designers) to keep it as timeless and simple as possible - peliqueiros history probably will not change and meaning of latter A also. Probably. As a contradiction to my design you can put current Arch logo. Cutout made from stretched circle, ragged edges for no particular reason, base of the logo (long arch from to bottom corners) is oddly uneven. Good they are not using the one with gradients/shine to much. I don’t want to make a design lesson here, but there is a lot more to my proposition than you can see on first sight. Even such thing as solid one for small version and wire for bigger ones should be taken in considerations during creation process and sometimes it’s not as easy as it looks like to keep them visually “the same”. About theming. I’m glad you can help with GTK one. I’ve watched as many reviews over the internet of antergos as I could and majority (all of them?) 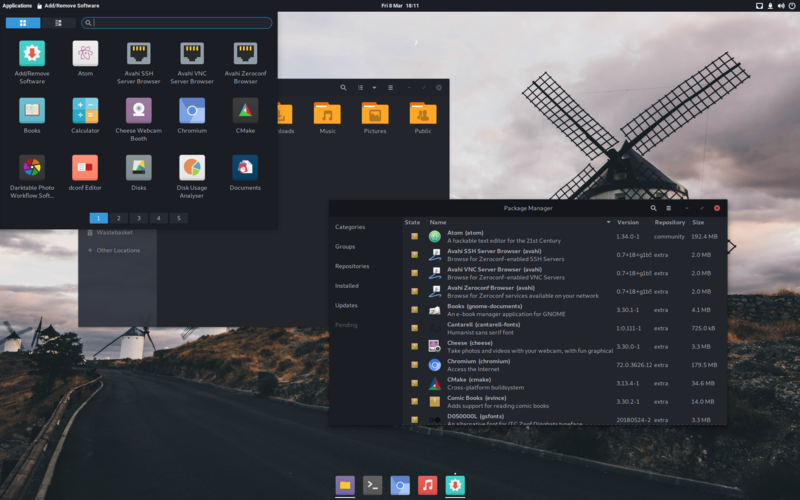 where reviewing Gnome DE. This is where we should start. I’ve looked for something as close to my vision as possible and found out a theme called Matcha (link in the first post). I can contact the author or maybe you can just change some needed parts, not much of it. This theme has nice light and dark version, which will perfectly blend into the design (after little changes). I don’t know how much effort is to make a little switch in the shell to change from light to dark or maybe even based on hours - day, night mode like android from 8.1. Let’s jump on the “save your eyes and brain” wagon. 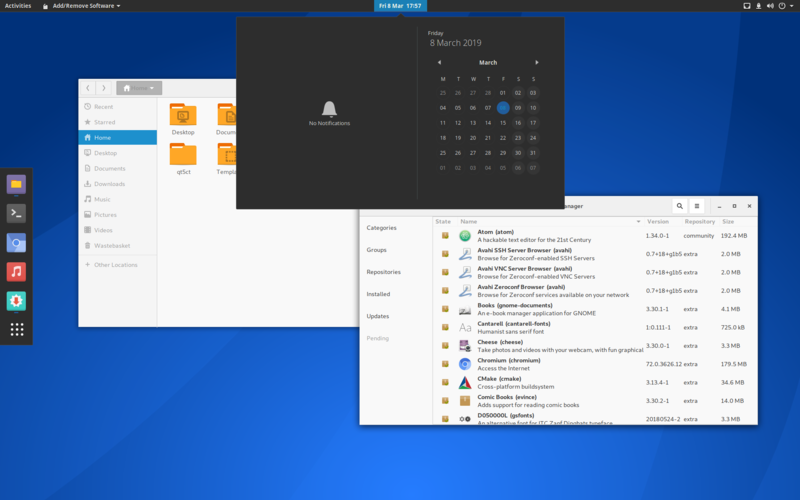 App menu for Gnome would be nice, as default “touch me with mouse” grid is… well… It’s horrible UX. I’m personally using Arc Menu but it’s also far from perfect. Reworked Slingshot in Pantheon is really nice and highly usable. For starters modified Arc would do the job. Website, wiki, forum, that’s on me. I’m developing WordPress themes sometimes. I’m realistic about how big this is, and how much is needed to be done. It’s not my first one, not even the biggest one (we do not need any print, for now). @ringo32 It’s not personal. Sorry, but that’s the way it is. Many clients (not only mine) butchered amazing designs because they didn’t liked it. Just like that. If you need money you finish it with your clients ideas and forget about it (too embarrassed to put it in portfolio) or you can do it like I do it and just ask them, why do they need professional if they knew better all along? Again, you are not arguing with your surgeon that personally you would like it done otherwise. I’m not blaming you in particular, this is common misconception about the design. People tend to know better because it look simple to make and it’s easy to criticize without knowledge (casus of taste), but they do not know the complexity of the process itself. Monkey can use a gun. Do you want to give guns to monkeys? @ringo32 I do not know your background in design field or to be precise in brand design, so I need to apologize in advance if I’ll be a little bit patronizing in my following explanations. I’m designer for over 13 years in business, I’ve made “couple” of brand designs - from small local entrepreneurs to stock market business. Firstly, current logo is not good. I’m not talking about your feelings, emotions towards it or even statements saying “I like it”. It’s not good from design principles point of view. I do not like to criticizes other peoples work, so this is all I want to say about it. Secondly, most of the Linux distros do not care about design to much, or not at all. For me personally it was always barier to move to one definitely. Why is that I don’t know, but I know that for many of my fellow professional users this is the main issue too. Logotypes of most distros are just horrible. 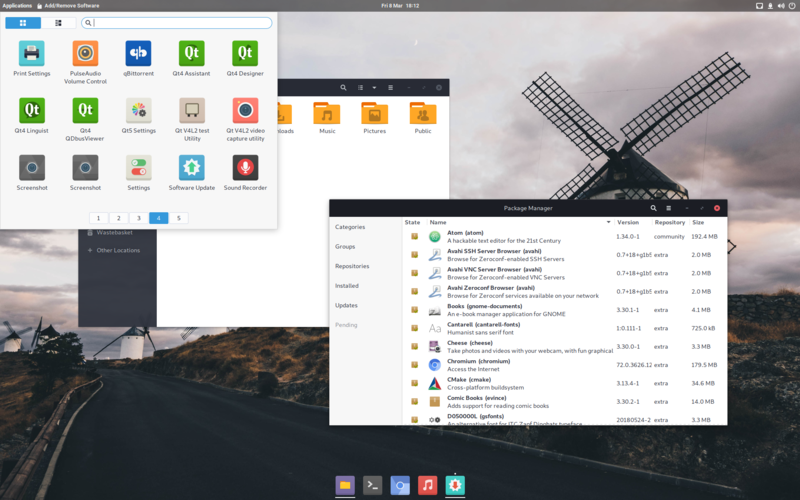 Ubuntu has something consistent and well made, elementary logo is not so good, but overall the distro design (and whole paradigm built around it) is amazing. The distro itself? For me… Meh. It’s mediocre. Still they are making fuss about it and gaining users (and money). This is the case. If you don’t believe me or in the importance of well put design, check history of the company you probably know, it’s name is Apple. On some youtube channel it was said sure, Logo’s can make a distro. @joekamprad I’m not a big fan of making changes to the existing logo design which in my opinion isn’t good (because it’s only logo and not whole brand design). I’ve never took a job with such request, because I know how painful and pointless this task is. Basically you need to make something good, with something that wasn’t planned enough before and most of your job is figuring out what could be acceptable and consistent keeping the old (not well made) design. Still making it similar. It’s strong no go from me. @ringo32 @joekamprad My work here is not to change the logo itself “because I want to” but to create whole corporate identity for antergos and make it strong brand on the market. Which is sum of many things that you can see on the diagram posted by me before in this topic. Desktop linux market is stagnant (in personal use segment), it’s like this for years. I’m preaching about using linux to my friends and family members but at the end most of them want me to “give them back” Windows, because something isn’t working as supposed to. If I dig deeper what exactly is not working, all cases are around lack of consistency in UI/UX. One example. My wife (which now is using antergos with modifed Gnome by me). “Why window won’t appear when I’m dragging file over the app icon? !” or “Why the power menu is looking different than folder window (nautilus, and she has before different theme for shell and applications)” - small things but for her and her workflow it’s infuriating. Wrapping up. I’m offering whole design, from top to bottom, working on every detail to make antergos not another distro on the market but a little pearl in the vast sea of similarities. And as I said in my first post - this is just the tip of the iceberg but we need to start with something to hear afterwards - it’s beautiful and it works. Just like our beloved Apple.